Jeniffer Hutchins currently lives in Lee's Summit, Missouri with her husband, Dan and their son Noah. She is enrolled as a student at Unity Institute & Seminary. Her creative life, along with Spiritual study, is the inspiration behind her artwork, teaching and blog. 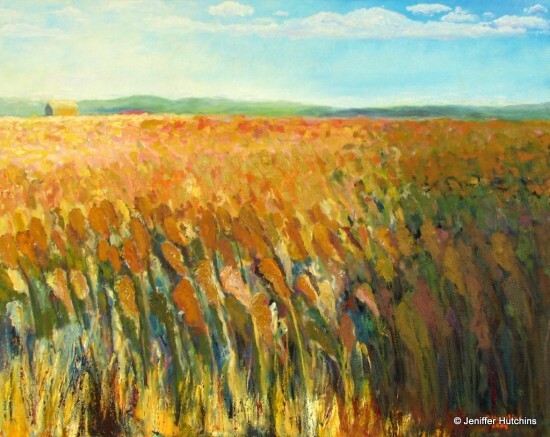 Inspired by her varied environments and travels cross-country and abroad, Jeniffer captures onto canvas the beauty of the world. Her impressionistic works have been showcased in several galleries from the East to West coasts including The Museum of the Living Man in San Diego California, The Nature of Art Gallery in Holly Springs, NC, Olde Town Gallery in Fayetteville, NC and the Unity Village Fine Arts Gallery in Unity Village, MO. Jeniffer also holds a degree in Art Education. As a teacher, her goal is to inspire self reflection, spiritual understanding and personal healing. She has instructed workshops through her company JoyfulArts Studio, as well as through The Institute for Arts Education in San Diego, CA, The San Diego Museum of Art, and Raven's Wing Healing Center in Southern Pines, NC.